Huston-Tillotson College is a four-year, private, independent, coed, liberal arts college affiliated…. Huston-Tillotson College is a four-year, private, independent, coed, liberal arts college affiliated with both the United Church of Christ and the United Methodist Church. The College displays its joint heritage with buildings named after representatives from each denomination. The former Tillotson College was affiliated with the United Church of Christ, while the former Samuel Huston College was affiliated with the United Methodist Church. Founded as Tillotson College in 1875, the school was chartered as Tillotson Collegiate and Normal Institute in 1877, and then renamed Tillotson College in 1897. Samuel Huston College was founded in 1876. Its name changed to West Texas Conference School in 1878 and then it was renamed Samuel Houston College in 1890. 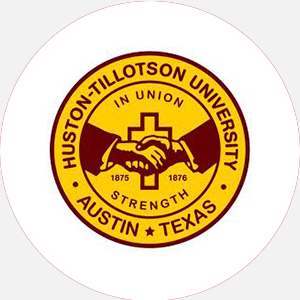 Tillotson College and Samuel Houston College merged in 1952 to form Huston-Tillotson College. One of the missions of the College is to provide experiences and services to a diverse, multicultural, and international student body. Huston-Tillotson is committed to the historic traditions of its founders and dedicated to providing the necessary skills, knowledge, experiences and attitudes essential for success in the twenty-first century. Huston-Tillotson is accredited by the Southern Association of Colleges and Schools (SACS) to award the Bachelor of Arts and Bachelor of Science degrees. Graduation from an accredited high school (or equivalent) with the following units: 4 English, 3 mathematics, 2 science, 2.5 social studies, 1.5 physical education, 0.5 health, 1 computer, and 7.5 electives. Student must have a high school GPA of at least 2.5, an ACT score of at least 18, an SAT score of at least 900, and three letters of recommendation from a principal, counselor, and teacher. Complete medical records are required. A nonrefundable application fee is required. Admissions Application Deadline: July 1 (Fall); December 1 (Spring); May 1 (Summer) Admission Contact: Admissions Office, Huston-Tillotson College, 900 Chicon Street, Austin, Texas 78702; Telephone: 512-505-3027 or 3028; 877-505-3028 (toll-free); 512-505-3192 (fax). A minimum of 120 credit hours with a GPA of at least 2.0. One year of course work at Tillotson and the last 30 hours in residence. At least 30 credit hours of concentrated course work must be completed for a major and at least 18 hours for a minor. Total enrollment (men/women): 312/338 In-state: 507 Other regions: 21 states; 18 international Full-time undergraduates (men/women): 267/291 Part-time undergraduates (men/women): 45/47 Ethnic/racial makeup: African American, 488; Asian, 3; Hispanic, 59; Caucasian, 3; Native American, 1; International, 86; Other/Unclassified, 10. Campus Regulations: All students are encouraged to live on campus and attend weekly convocations. Campus Services: Health center, student employment, career planning and placement, and religious services, including chapel. Campus Activities: Social or group activities include theater, band (including jazz), and chorale. Students may work on the student-run newspaper or yearbook. Communication majors may work at the campus television station. Leadership opportunities can be found in the Student Government Association (SGA), nine academic clubs, or other student-run organizations. Greek-letter sororities include Alpha Kappa Alpha, Delta Sigma Theta, Sigma Gamma Rho, and Zeta Phi Beta; fraternities include Alpha Phi Alpha, Kappa Alpha Psi, Omega Psi Phi, and Phi Beta Sigma. Honors societies include Kappa Xi, Alpha Kappa Mu, Beta Kappa Chi, Phi Beta Lambda, and Sigma Tau Delta. Housing Availability: 472 housing spaces. Handicapped Services: Wheelchair accessibility. Bachelor of Arts: English, History and Government, Mass Communication, Music, Physical Education and Recreation, Political Science, Psychology, Social Science Composite, Sociology Bachelor of Science: Accounting, Biology, Business Administration and Management, Chemistry, Computer Science, Education, Finance, Hospital Management, Hotel and Restaurant Management, Human Resources Management and Industrial Relations, Marketing, Mathematics, Physical Education, Public Management.